Chasin' Mason: [Countdown to Halloween] Halloween! 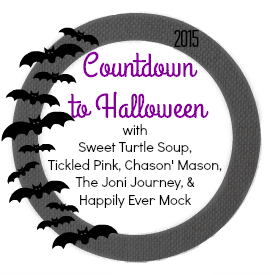 I can't believe today is our last link up in our Countdown to Halloween series. Sadly this means that Halloween has come and gone and it is officially November now. Even though I am sad that time is going by way too fast this year, I'm not too sad that now have Thanksgiving and then Christmas to look forward to. But anyway, I'm getting ahead of myself. Let's recap Halloween! I'm sure I said this last year, but this year was officially the best Halloween yet. SO. MUCH. FUN. The holiday started off on Thursday when they had a little Halloween party at Mason's school. We dressed him in his T-Birds outfit and off he went. They had a potluck lunch and went trick or treating as well. When I picked him up that afternoon, his teacher told me he had a blast trick or treating! Then came Friday and we went to the trunk or treat at Seth's mom's church. We went last year and had a lot of fun, but Mason wasn't really into the whole trick or treating aspect. This year though was TOTALLY different. The kid wanted to hit every trunk possible and even tried to cut his way up to the front of the line on multiple occasions. This year they did it a little bit differently in the fact that you got to play a game once you got to the front of the line and then you got your candy. Mason wasn't so good at the games though and they let him try over and over until he got it or just let him try and then gave him the candy. He didn't care though, the candy is what he was there for, but I thought the game idea was a fun addition. There was even one group that brought their classic car out and dressed up like pink ladies and T-Birds so of course we had to take a picture in front of their car! In addition to the trick or treating, they had a cupcake decorating station, tons of bounce houses and bounce slides, food trucks, Chick-fil-A, music, and so much more. It was a really fun start to our weekend! Saturday rolled around and we started the holiday off festively with pumpkin pancakes. I definitely can't take the credit for these though. First of all, I didn't even come up with the idea. I have to thank Desiree and Whitney for that. And second of all, I can't even take the credit for making them - that was all Seth. But nevertheless, we had a festive breakfast! Then Seth and I dropped Mason off at his ABA class (where they also had a fun Halloween party) and we ran tons of errands. We picked Mason up a few hours later and then let him nap for a few hours before we went to party some more. 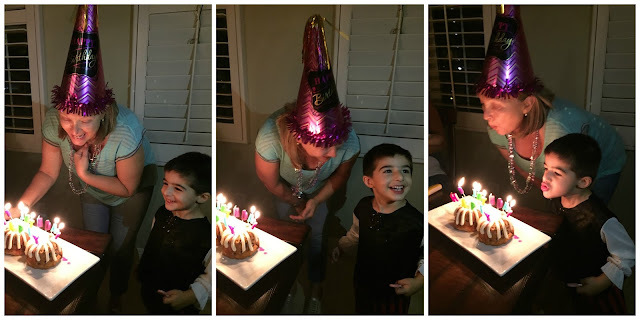 Not only is October 31st Halloween but it's also Seth's mom's birthday! So double the party! I made some mummy dogs (minus the cheese) for the kids for dinner (the adults had Panini Cafe) and some candy corn cupcakes for dessert. I also picked up some gluten free bundlets for my mother in law for dessert. We went over to my sister in law's house around 5pm, had dinner to celebrate the birthday girl, went trick or treating and then came home for dessert. I didn't even think about the fact that we were going to be getting TONS of candy when I made dessert, but I just couldn't pass up the opportunity to make those cute cupcakes! Trick or treating was possibly the most fun we've had in years. 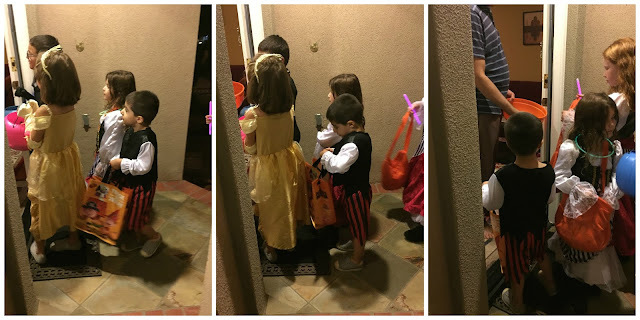 We used to go to my brother in law's parents neighborhood and there was a good amount of kids but this year my niece's wanted to trick or treat around their neighborhood and I'm so glad we did. Not that the other neighborhood was bad by any means, we have fun there too, but there were SO MANY KIDS out on Saturday night. Like how I remember it as a kid. It was so much fun! Mason was a little shy (lazy?) at first and made Seth or I carry his bag. He would want to walk to the door to get candy but he would want them to just hand it to him or if we made it to the front in time, we'd hold out the bag. Then something switched and he was ALL about holding the bag and walking to the door. At this point the bag was getting pretty heavy (people were super generous with the candy!) but he didn't care. He half dragged/half carried it all around the rest of the neighborhood until we decided it was time to go home. Seth's aunt and uncle stayed at my sister in law's house and said over 230 trick or treaters stopped by while we were gone... and we were probably only gone for an hour and a half! Crazy. We came back to eat dessert, sing happy birthday to Nanny, and check out the loot and let me tell you we (I mean, Mason...) did good on the candy front! 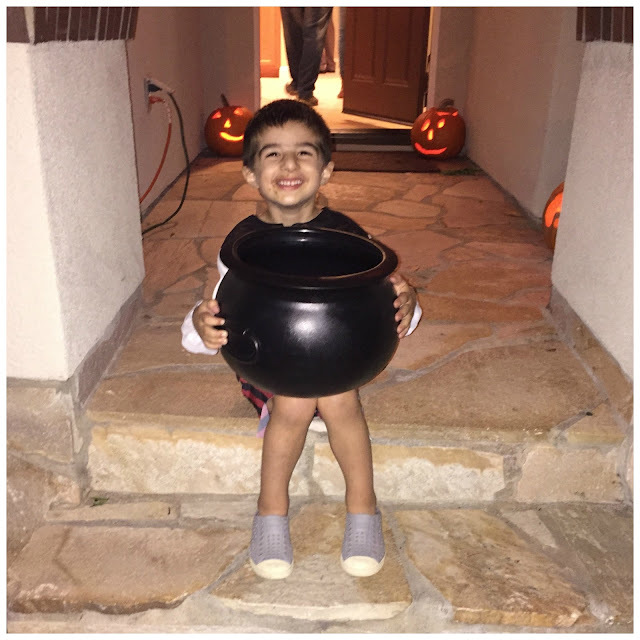 After we checked out the candy and had dessert (and of course watched Game 4 of the World Series), Mason decided he wanted to be the official candy hander-outer and grabbed the bucket and headed outside to wait for trick or treaters. Bless his heart. 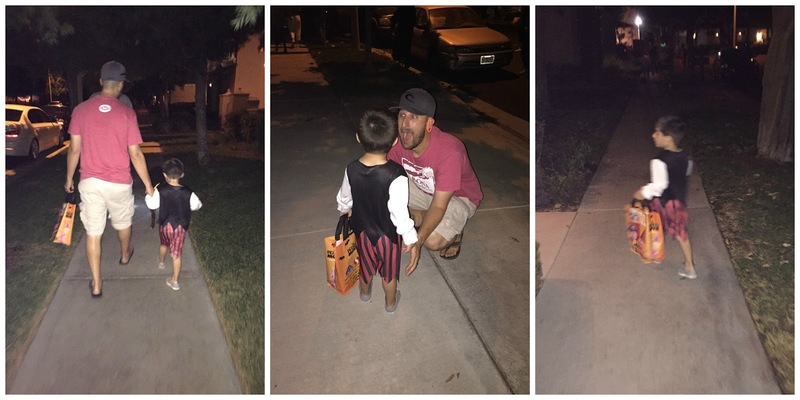 It was getting late and there weren't many people out (and we had pretty much run out of candy) but he refused to come inside, he wanted to wait for people to come. It was so, so sweet! This Halloween was so much fun and I'm kinda sad it's already over. My pictures aren't the greatest, but the memories are there and that's what matters. Now show us! How was your Halloween? Link up with us below! Aria went to bed right after we came back from trick or treating. How late did Mason stay up??? And oh gosh that is a full neighborhood. We usually have a ton, and run out of candy. There was hardly anybody this year and now I have a ton of candy left. I'm packing that off to Chris' work today. Get that outta my house! Love the mummy dogs and pancakes! And the classic car pic! And that you made cupcakes to come back to after trick or treating for candy lol. Mason is the cutest pirate ever! Looks like you had a great Halloween! Sounds like a fabulous weekend! Love your new blog layout, too! Oh my gosh, how fun!! :) Your mummy dogs are PERFECT. :) Mason looks like he THOROUGHLY enjoyed himself, especially. Love both of Mason's costumes! So cute that he coordinated with his cousins. That's how I remember trick or treating being like when I was young too. Big groups of kids running around and too much candy to carry. So much fun! 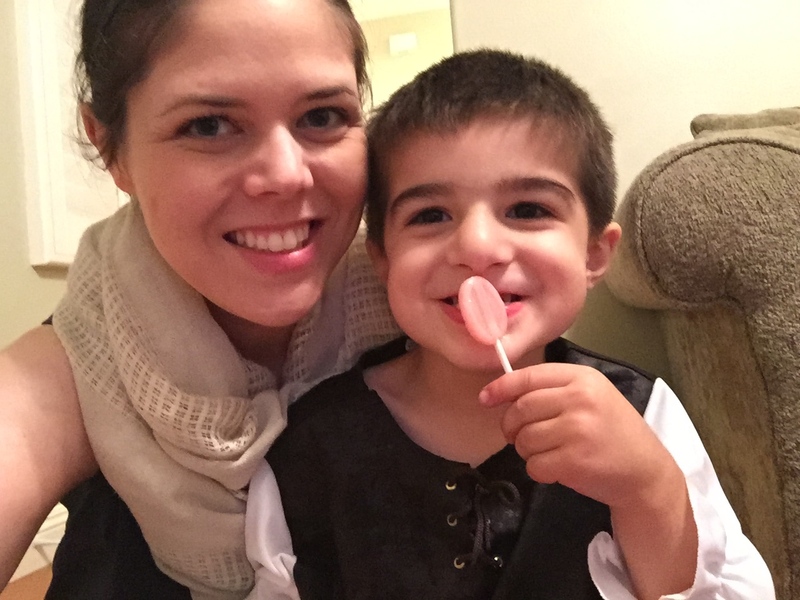 So many Halloween parties and so much fun! I loved your T-birds theme, and the Pirates, too! Woohoo for Jack o lantern pancakes. And Marcus lived handing out the candy too (maybe morw than trick or treating)! What a fun Halloween! 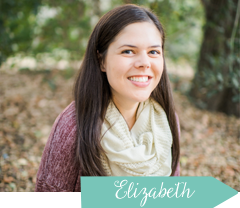 You are so crafty and creative, Elizabeth! I love the mummy dogs!! Glad Mason had a great time trick-or-treating!! Oh my gosh! So many Halloween parties and trick or treating! I love the classic car that you guys got a pic with! How perfect! The pirate costumes the night of are pretty amazing as well! 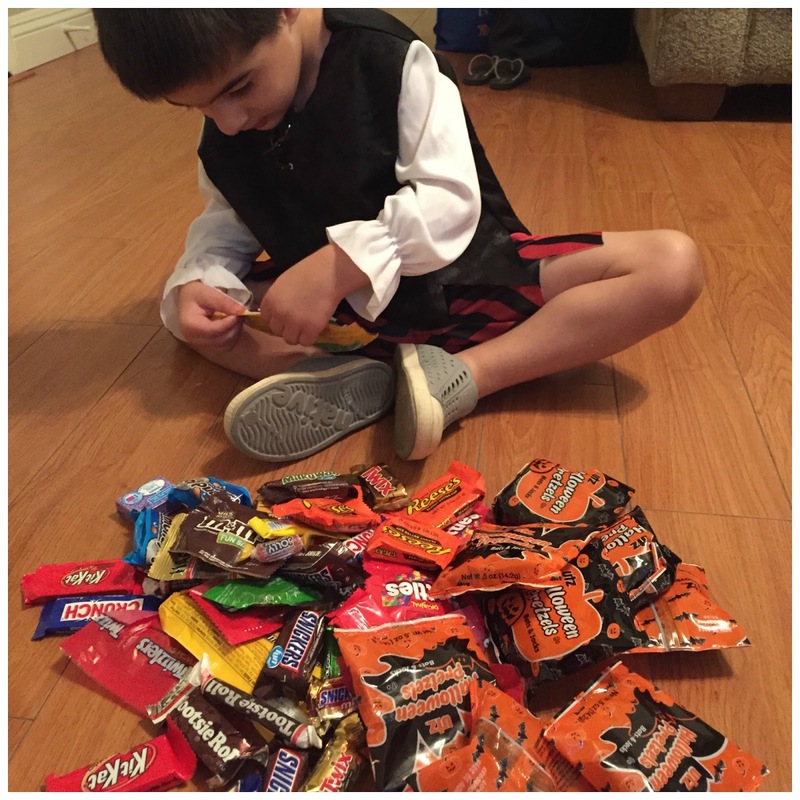 Looks like Mason got a ton of candy! I think the games were a cool idea too but glad they just let him get candy and not make it too hard. Looks lik a totally amazing Halloween weekend! That sounds like so much fun! I'm jealous you guys got that kind of trick or treating experience! We have the kind of neighborhood that you'd think would get more trick or treaters! We do get some but nothing like what you described! I think it would have helped Noah get more in the mood. He gave up after maybe 6 houses! I also love all your themed food, even if Seth made those pancakes ;). Mason's grin says it all! What an awesome Halloween! Yay for pumpkin pancakes! I wish I had thought to add chocolate chips lol. I had a lazy trick or treater too, of course us moms end up hauling around the candy bag ;) Seriously, October just flew by! I love all the festive foods! And Mason's happiness shining through the whole weekend! 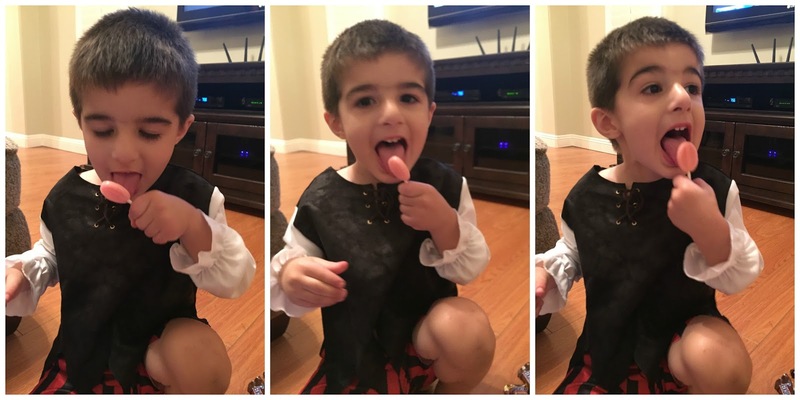 He got a ton of candy and looked super cute in his pirate costume! I can't believe it's over, either! Time needs to slow down! Mason is just the cutest! This definitely was the funnest year yet! I am so sad October is over. It was such a fun month. I hope November slows down so that we can enjoy it longer. :) Looks like a really fun Halloween weekend. I love the pirate theme. And I loved seeing y'alls festive breakfasts. Look how happy he is!! And those candy corn cupcakes--yes please! I'm also a little bummed that Halloween is already over. I mean, how did that even happen?!? So much fun. That sounds like one pretty epic Trunk or Treat too! I love the goodies you made. So much fun to be so festive with your food. I can't believe October is gone. It always goes by way to fast. I'm glad I'm not the only one who didn't get the photos she wanted. Connor just didn't care enough to pose so I had to promise goods/services to get him to give me the shots I got!